Sedum palmeri is a low growing ground cover plant, evergreen and reaching around 15cm or 6 inches in height. It has a natural trailing habit and will slowly spread to form a dense clump. The foliage forms in tight rosettes and bright yellow flowers from winter into spring. 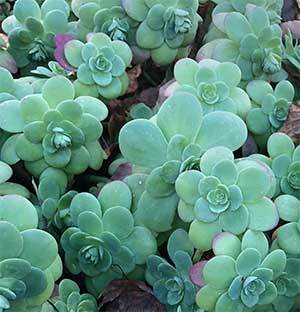 Like many Sedum varieties, it grows well in full sun, however is better in a little afternoon shade in warmer climates. Excellent in a rock garden, a dry part of the garden border or when grown in containers. Once established this is a very easy care plant. You will rarely need to water it, and although it will spread slowly it is not seen as invasive. This is a species that will grow well in shade, in which case the foliage will be a pale green, however in sun the foliage will be tinged with a rosy pink. Choose a well drained soil, or plant Sedum palmeri up on a mound. After the first summer it will need little help with water. Prune back at any time of the year to maintain a more compact growth habit. You can prune back any errant runners, usually just by breaking them off. You can also cut back in spring to keep the growth habit a little more compact. Very easy by division of established clumps also possible from cuttings. Flowers – Yellow daisy like flowers in late winter to spring. Foliage – Mid blue/green with red blushes in winter.